The following information may be of interest to you and help you to understand how the British Korean Veterans Assocation can be of assistance to all veterans of the Korean War and members of the subsequent Peace Keeping Forces in Korea. 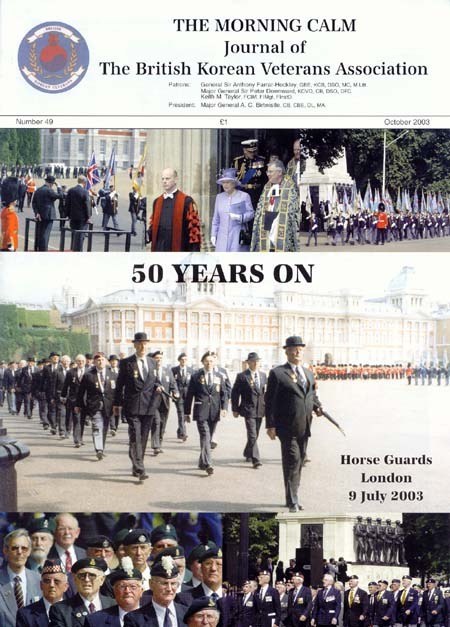 The BKVA was formed at an inaugural meeting held at Imphal Barracks, York on Saturday 26th September 1981, through the amalgamation of the National Association of Korean War Veterans (UK) and the British Korean Veterans Association. We are members of the International Federation of Korean War Veterans Association, whose headquarters are in Seoul, South Korea, and which promotes the interests of all who fought in the Korean War. The prime objective of the BKVA is to organise, develop, enter into and carry out or co-operate in any endeavour for the benefit of men and women of all ranks who served in the Korean War 1950-53, and subsequent Peacekeeping Forces, or for the benefit of their widows and dependants, and generally to promote their welfare and the relief of distress. The BKVA is non-political and offers comradeship to all those who served. The BKVA has a Relief Fund and a national welfare policy, which incorporates all branches. When the needs of veterans are made known they can be acted upon quickly. The BKVA's authoritative body is the National Council, whose membership is made up of elected Executive Officers, elected National Council Officers, and one member from each of the Association's ten areas. All are volunteers although out of pocket expenses are normally paid when claimed. There are currently 59 branches in Great Britain and one in Northern Ireland. New branches are formed as the need arises. The Association's Journal Morning Calm is published twice a year, and each paid up member is entitled to receive a copy. Many branches also publish their own newsletter or magazine. Patrons of the Association are General Sir Anthony Farrar-Hockley GBE, KCB, DSO, MC, M.Litt, Maj. General Sir P A Downward, KCVO,CB, DSO, DFC, and Mr. K M Taylor FCIM, FIMgt, FinstD, all distinguished Korean War Veterans. The president is Maj. Gen. A C Birtwistle CB, CBE, DL, MA. and current Chairman is Col. G M Gadd. Throughout the year, in many parts of the country, events are organised which are open to all Korean Veterans. These occasions allow veterans, together with their wives, to come together and renew their fellowship. The BKVA hold an Annual General Meeting in October, which incorporates some social events. In addition, many branches organise special functions to which they invite members of other branches. In co-operation with the Korean Veterans Association, Seoul, in the Republic of Korea, the BKVA organises an official Re-visit programme, details of, which are available from branch secretaries. The BKVA maintains strong links with the Korean Embassy, Korean Residents Associations and Travel Oganisations in the UK, where there is an interest in joining together for cultural ties and joint projects. We recognise and appreciate the willingness of Korean people in the UK to support our veterans and their needs. The present membership is about 4,000 and growing. Every effort is being made to recruit more members - we are aware that there are still many hundreds of Korean Veterans who would benefit from membership in the BKVA. We also encourage Associate Membership of individuals and organisations supportive of our objectives.